The Chincoteague pony was made famous in Marguerite Henry’s book Misty of Chincoteague. The ponies live on the barrier island of Assateague in Maryland and Virginia. It’s thought that their decedents were either from animals that swam to the islands from a shipwrecked Spanish boat in the 1600s or from animals turned out in the 1700s. Life on the island is hard, and the ponies have adapted to eating beach and marsh grasses. The ponies on the Virginian side are owned by the Chincoteague Volunteer Fire Department. Those on the Maryland side are owned by the Maryland Park Service. 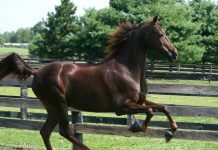 Each year the ponies in Virginia are swum across the channel; the foals are auctioned and the mares and stallions returned. The ponies are ridden English and western. The island environment shaped the pony into its modern appearance. 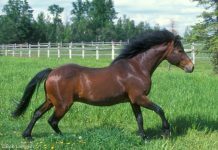 They have strong hooves, thick manes and tales, and light fetlock feathering. The Chincoteague pony is seen in all colors but most common is a very colorful pinto; strawberry roan on white and palomino on white create some of the brighter patterns. They stand from 12 to 14.2 hands high.